BEACON FALLS — When a call for help goes out, Beacon Hose Company No. 1 firefighter Ryan Caulfield is ready to answer it. Even if that call comes from across the country. Caulfield, a 24-year-old Naugatuck resident, spent two weeks in August fighting wildfires in Colorado. Caulfield, who has volunteered as a firefighter with Beacon Hose in Beacon Falls for about four years, works as part of the security staff for the Connecticut Department of Energy and Environmental Protection. Since he volunteers as a firefighter, it was recommended to Caulfield that he join the DEEP’s fire crew. The DEEP maintains a roster of agency staff members and personnel from local fire departments who have been certified to fight forest or wildfires. Crew members must complete a rigorous training program and participate in an annual renewal course. Three months after completing his training, Caulfield was chosen as part of a 20-man team that traveled to Colorado to assist with two wildfires totaling approximately 800 acres in the Buttermilk and Green Mountain sections of the state. The assignment was for 14 days. Once he received the call to go, Caulfield said everything moved fast. The call came in on a Tuesday and, three days later, on July 27, he was on a plane headed out west. 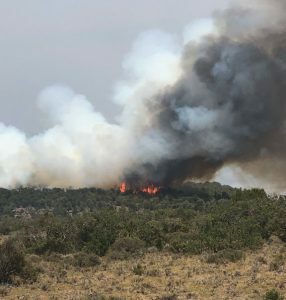 When they touched down in Denver, Colo. four firetrucks were waiting to take the team to the forestry cache, where they stocked up on all the tools they would need, Caulfield said. “From that point we got sent directly to our fire,” Caulfield said. The crew was first sent to help with the fire in Buttermilk Mountain section. The crew was slated to be a type 2 initial attack crew, which meant it would be doing work to prevent the fire from spreading if it came too close to structures or towns instead of directly fighting the fire, Caulfield said. 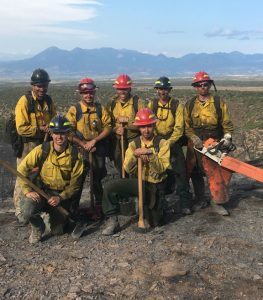 However, since there were numerous wildfires across the western half of the country, the crew did “hotshot” work, which includes both preparing and actually fighting the fire, Caulfield said. “That was really cool. A lot of the older guys we were with said it is very rare that you ever get to do that and they have been on 14 or 15 assignments. So it was cool for that to be a first assignment for us,” Caulfield said. While working inside a crater, or bowl, on the mountain, the crew noticed black smoke coming over the ridgeline, Caulfield said. Black smoke indicates that the fire is close by. The team made it back to the planned fire line and, after ensuring everyone was safe, began making preparations to stop the fire from moving forward. However, the wind shifted and ultimately took the fire in a different direction, Caulfield said. Although the crew didn’t have as close an encounter while fighting the Green Mountain fire outside of Gunnison, the second location had its own set of complications. The crew had to keep an eye out for large logs and rocks rolling down the mountain. “This one we were literally working on a mountainside. The ground was nearly at a 90 degree angle,” Caulfield said. Although the trip marked the first time he fought wildfires in another state, it wasn’t the first time Caulfield went out of his way to lend a hand. In 2017, Caulfield was part of a crew of local volunteer firefighters that helped deliver supplies collected by Beacon Hose to people in Texas after Hurricane Harvey hit the state. Caulfield said his passion for helping people comes from his father, who was a volunteer firefighter and recently retired as police officer after 35 years.